The Bible Overview eBook provides an excellent summary of each book of the Bible. In less than 30 minutes, you will know the author, date, theme, purpose, recipient, outline and the key verse of each book in the Bible. When you understand how the Bible is organized and what is important about each Book, it becomes much easier to study the Word of God. The Bible Overview shows you how the Old Testament is divided into the Books of the Law, History, Poetry & Wisdom, Major Prophets, and Minor Prophets. Similarly, the New Testament has its own collection of Books: The Gospels, the Acts of the Apostles, Paul's Letters (Paul's Epistles), General Epistles and Revelation. The Bible Overview eBook is an excellent Bible study resource for new believers or for anyone who wants to learn more about the Word of God. 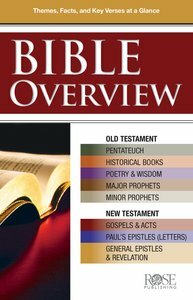 About "Bible Overview: Know Themes, Facts and Key Verses At a Glance (Rose Guide Series)"